Tax-effective giving means that the money you raise or donate to us at Áiseanna Tacaíochta (ÁT) can go a lot further: it turns your €250 gift into €362 at no extra cost to you, making a huge difference to us and the people who we support. What is tax effective giving? Since January 2013, Irish charities have been able to claim back significant tax relief on your donations under the Revenue Commissioners’ Charitable Donations Scheme, once you have given a minimum of €250 to the charity in a single calendar year. This represents an extremely valuable of raising much-needed funds for your charity without costing you anything extra, meaning that your money has an even bigger impact. If you donate money or shares worth €250 or more in a single year to a charity, the Revenue Commissioners assume that you have paid a 31% rate of tax on these donations. They then increase the donations by that amount to determine the appropriate tax relief available to the charity. So, this means that your donation of €250 is actually worth €362 to us; €500 becomes €724; and €1,000 turns into €1,449! 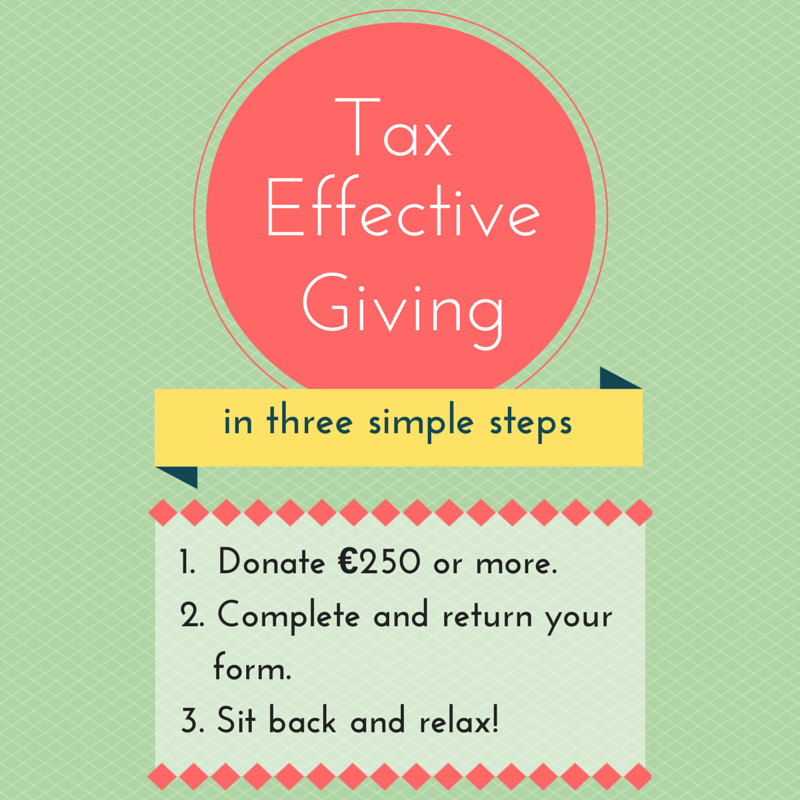 If you are a Pay As You Earn (PAYE) or self-assessed tax payer, we can benefit from tax relief on your donations to us! Your donations amounting to €250 or more in a year are eligible under the scheme. These can be given in the form of money or designated securities, or a combination of both. Cash donations made in instalments – such as by Standing Order – and donations received online also qualify. The only reasons why we wouldn’t be able to claim the relief are if the amount being claimed is less than your tax payment in the relevant year, or if the details given in the forms – as outlined below – were inaccurate. All you need to do is to quickly complete one form and return it to us – it’s that easy! The form takes very little time to fill out and, once done, doesn’t even have to be renewed for a number of years. With either of the chosen forms, you provide your Personal Public Service (PPS) number and sign a declaration which gives us permission to claim back the tax relief during the relevant time period. We keep a copy of the form for audit purposes, subject to data protection rules. Either form can then be easily renewed online or by phone, text, email or letter through Revenue, saving you time and effort. You can cancel an Enduring Certificate at any time, but do take care to let us know that you are doing so. You should also inform us of any changes to your circumstances which may affect the payment of tax relief. Please return your forms by sending them to us at Áiseanna Tacaíochta (ÁT), Chase House, City Junction Business Park, Northern Cross, Malahide Road, Dublin 17. We’d love to hear from you: just get in touch with Orlaith Grehan – by calling 086 183 1502 or emailing orlaith@theatnetwork.com – with any questions about tax-effective giving that you may have. More information about the Charitable Donations Scheme is available on the website of the Irish Charities Tax Reform Group (ICTR): click here to find out more about tax-effective giving. The Revenue Commissioners provides some information on its role in relation to charities through its website: click here to see Revenue’s frequently asked questions about charities.